Village Russia is one of the favorite themes in the works of Serov. Who, if not Serov, could accurately reproduce the daily life of the peasant life, show the working life of the peasants. The artist did not reproduce the underlined wretchedness of the village or the embellished nature: he looked at the village from the point of view of a realist. But Serov’s village paintings are endowed with notes of tenderness and cordiality, such as, for example, “The Woman with a Horse” of 1889. In the center of the picture is a young Russian girl with red cheeks and a fervent smile. She clings to the bridle of her horse, which is noticeably overgrown, and her mane falls over her eyes. Serov painted in a real frost. It is impossible to work with oil paints in such weather – Serov decided to put off the paints and take up pastel. As the artist said, he wanted to reflect in the picture the joyful feeling of the Russian frost, which would redden cheeks a lot and make the horse cling to its owner. Serov did not paint alone: ​​peasants surrounded him at the beginning of his work. Only a few strokes were enough for peasants to start shouting out the names of what they saw on pastels: nose, lips, handkerchief. The villagers, to the very end, observed the work of the artist and were surprised at how Serov was skilled in drawing. It seemed to be enough to take a pencil to also realistic depict the environment. Serov repeatedly admitted that it was not critics that made him proud of his work, but the peasants and their approval. 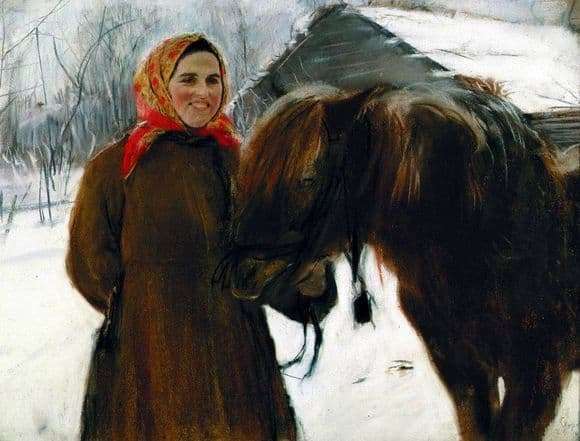 Several decades have passed, and Serov’s “Woman with a Horse” to this day reflects the veracity of country life in the frosty Russian winter.